This entry was posted in Uncategorized on August 31, 2012 by Gary. 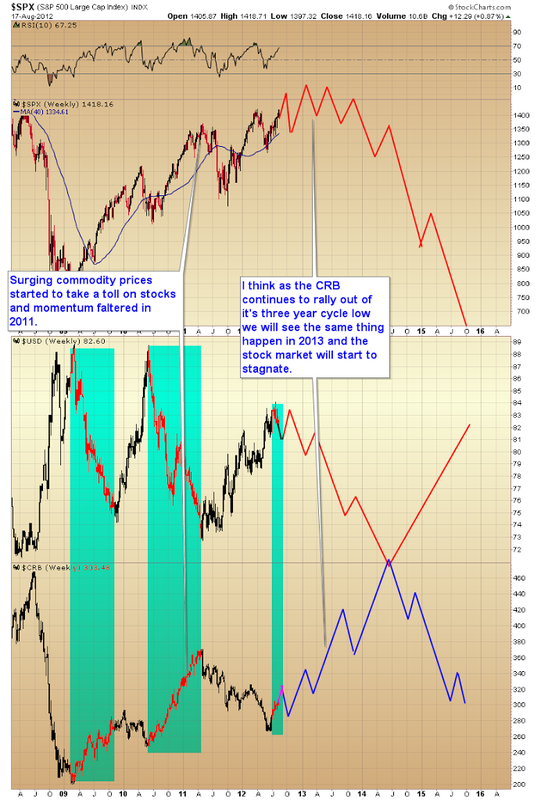 Just a quick post today illustrating what I expect over the next 2 years, and the intermarket relationship between the currency markets, CRB and stocks. Pay particular attention to the inverse relationship between the dollar index and the CRB. Notice how the CRB almost immediately began moving down into it’s three year cycle low once the dollar formed it’s three year cycle bottom in May 2011. Stocks are driven by not only the dollar but to some extent by commodity prices. When commodities start to surge too high they act as a drag on the economy and consequently the stock market begins to stagnate. When commodities are falling, like they have been for the last year, it tends to act as a mild tailwind for the stock market, which explains why stocks have continued to rise for most of this year despite the dollar moving generally upwards since February. I think I have mentioned before that virtually every recession since World War II has been preceded by a spike in oil prices of 80%-100% over a short period of time (usually a year or less). The surge from $50 a barrel to $100 in 2007 was the straw that broke the camels back and tipped the economy over into recession, which began in November 07. A further spike to $147 a barrel the next summer guaranteed that the recession would be the worst since the Great Depression, especially considering that the real estate market and debt bubble was imploding at the same time. Now that the CRB has formed its three year cycle low the dollar index should be at or pretty close to a final top, which should then be followed by a move down into its next three year cycle low sometime in 2014. If the intermarket relationships continue to hold up, and I don’t see why they wouldn’t, then we should see commodity prices moving generally north for the next couple of years until the dollar forms its 3 year cycle low in mid-to-late 2014. At some point along the way rising commodity prices are going to begin pressuring the economy, just like they did in 2007 and 2008, and also in 2011 as the CRB surged up into its final three year cycle top. My current guess is that we will see the stock market start to stagnate in 2013 forming a very extended rounded topping pattern. By late 2013 the stock market should be clearly in a new bear market that will begin to accelerate to the downside as commodities spike into their final top as the dollar bottoms in 2014. At that point I expect to see a severe deflationary event as the stock market and commodities collapse, similar to what happened in the fall of 2008 and early 09. This collapse and deflationary event should be accompanied by the dollar rallying out of its next three year cycle low in 2014. Most bear markets tend to last between 1 1/2 to 2 1/2 years so we can probably expect a final bottom in early to mid 2015. This entry was posted in Uncategorized on August 19, 2012 by Gary. Well, it’s that time again. Every two years our senses are assaulted as politicians spew an endless stream of nonsense in the attempt to garner votes from a mostly unsophisticated American population. This year the major topic, not surprisingly, is jobs. Each and every politician would like you to believe that he or she has the cure for the persistent unemployment problem. Of course it’s all completely ridiculous. You would think these people could read a history book. Never in history has government been able to legislate productivity. Governments just misallocate capital. They tax one group of people and give the money to another group of people to dig holes. Of course, once the hole is dug or the road built, that job expires. It’s not a sustainable productive use of capital. Real productivity is entrepreneurs creating sustainable companies that satisfy a human need. AAPL is a sustainable business satisfying a human need. GOOG is a sustainable productive business. XOM is a productive business. None of these companies were legislated into being by government. Almost without exception, real progress involves creative destruction. For example, when oil was discovered the whaling industry collapsed. When the automobile was invented it destroyed equine powered transportation, and so on. The emergence of each new major technological advance, throughout the history of mankind, has caused creative destruction obsolete industries. This is part of the normal and healthy sequence of human progress. Progress is a result of replacing inefficient technologies with ones that are not only new, but more efficient. Likewise, nations that refuse to allow this process of creative destruction are exactly the economies that stagnate and ultimately fail. There is one way, and one way only, to cure our employment problem (and debt problem). It is the same cure that ultimately ended the Great Depression and serviced the gigantic debts that were incurred during World War II. A new technological advance that changed the world. The cure for the Depression and massive debt built up during WWII was the advent of two brand-new industries: plastics and electronics. These two industries created millions of jobs worldwide and spawned an economic boom from 1945 until 1966. Now the world is back in the same position it was in 1930, and where Japan found themselves in the early 1990s. The world has created another debt bubble and we’ve chosen to kick the can down the road just like Roosevelt did in the ‘30s, and Japan has been doing for the last 20 years. And just like in the ‘30s, we are going to get the same result which is persistently high unemployment and generally declining global economic conditions. What we need to do is allow human ingenuity and creative destruction to actually cure our problems. And the biggest problem the US faces today is the triple threat of Social Security, Medicare, and Medicaid. These three entitlement programs have bankrupted the country, and let’s be honest, there is no way any politician can possibly reform these programs, or even attempt to do so, and have a prayer of getting elected. The cure to our problem is staring us right in the face. We don’t need to reform Social Security, or government health programs. We need to make them obsolete. Rather than plowing taxpayer dollars into an insolvent banking system (as the Japanese have been doing for 20 years), we need to allow capitalism to work and insolvent companies to go bankrupt. The taxpayer dollars that are now flowing into an endless black holes which are the financial system and government stimulus programs, need to be funneled into the biotech industry. Rather than fund expensive surgeries or endless treatments that only manage symptoms, we need to discover real cures for disease, injuries and aging. Imagine if a person with an arthritic knee, instead of a $20,000 knee replacement surgery, could simply walk into the doctor’s office and receive a stem cell shot that would repair and permanently cure the disease. Or, how about a permanent cure for diabetes, heart disease, and obesity? Yes, what I’m talking about is a complete overhaul of the global healthcare system. Yes, this is going to be creative destruction on a massive scale. Many doctors that studied for years are going to be put out of business. Health insurance will become mostly a thing of the past as the modern healthcare of the future will become easily affordable by all. No different than buying an iPhone today. Yes, some industries are going to suffer and go bankrupt, like health insurance, and a big part of the pharmaceutical industry. But millions and millions of jobs will be created, the same as they were in the 50′ & 60’s with the new plastics and electronic industries, and in the 80’s and 90’s with the personal computer and internet. When we reach the stage when we actually cure diseases, especially as related to aging, we will eliminate the gigantic burden of the three big government entitlement programs. If people can remain healthy and active for their entire life there will be no need for Social Security benefits or Medicare and Medicaid. These programs will become a thing of the past, as most diseases, and injuries will be quickly and easily reversed or permanently repaired. So instead of the same old nonsense drivel we get during every election, it would be refreshing if politicians understood the real problems, and the real cures, and put in place policies that would actually have long-term benefits and accelerate the transition through these dark times and into the next Golden age. This entry was posted in Uncategorized on August 17, 2012 by Gary. In last week’s article “Three Weeks Left” I outlined a brief synopsis of what I was expecting based on how the daily cycles were unfolding. So far markets are playing out pretty much as anticipated. This week I’m going to go a bit more in depth and tie cycles analysis with the upcoming fundamental calendar, namely the next two FOMC, and Jackson Hole meetings. As you may recall from the last article, the dollar index is in the process of moving down into an intermediate degree bottom, which in turn is triggering a rally in virtually all risk assets, most noticeable in the energy and grain sectors as the CRB exploded out of its three year cycle low. I think we will probably see the dollar continue to drift generally lower for most of the remainder of this month, possibly even into the Jackson Hole meeting as traders continue to hope for the next round of QE. 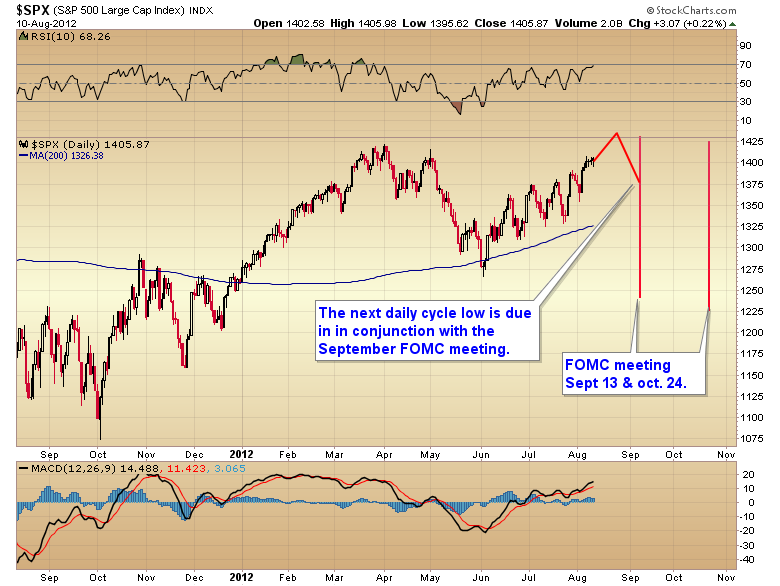 When the Fed fails to deliver, which they almost certainly will, we should see the market start to move down into its daily cycle low, which coincidentally is due almost exactly on the September FOMC meeting. The September FOMC meeting will be the opportunity for the Fed to shorten the stock market intermediate cycle and possibly abort most of the move down into the yearly cycle low due in October. However I think the Fed is probably going to balk at the September meeting also, and when they do it will initiate the real move down into the normal timing band for an intermediate, and yearly cycle low in late October, or early November. I suspect that the Fed will finally cave at the October meeting and begin an open ended QE with the misguided goal of achieving a nominal GDP target and lowering the unemployment rate. The one caveat would be that the Fed meeting in October would call for a slightly short stock market daily cycle, which is not unusual if the market is experiencing a hard decline. Another possibility, although one with lesser odds in my opinion, would be a final intermediate, and yearly cycle low on the November employment report, or the presidential election results which would stretch out the daily cycle to its normal duration of 35-40 days. Based on the current cycle count, and taking into account the timing band for the next two FOMC meetings, and the dollar’s current intermediate cycle we should trigger a top in the stock market sometime around the end of August. However let me warn bears that the move down into the intermediate bottom is not going to be an easy short. I expect we will see most of September chopping back-and-forth with several retests of the highs before finally rolling over. Most of the losses will probably come in the final 5-10 days before the bottom. Like I said not an easy market for bulls or bears either one. 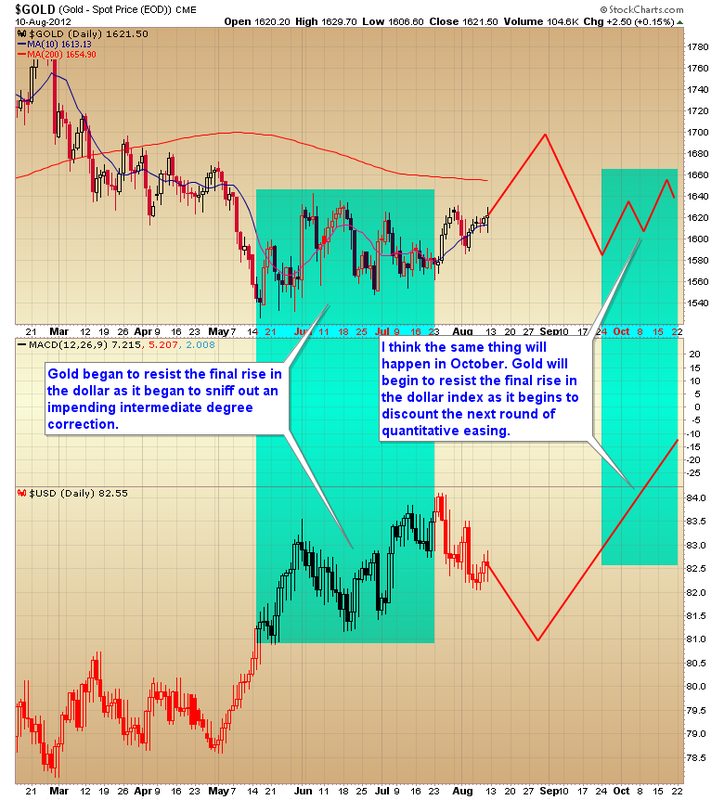 Gold is a bit of a different animal than the stock market and its intermediate cycle has a different duration. But gold is still tethered to the dollar index as it continues working through the consolidation phase of this new C wave. Here is a chart I posted back in February depicting the extended consolidation that I was anticipating this year. Considering that gold is still in this consolidation phase I think we are probably going to see a test, or more likely a break of the D-Wave trendline as the dollar completes its move down into its intermediate cycle low later this month. That should be followed by an intermediate decline that should bottom ahead of the stock market in mid to late September. 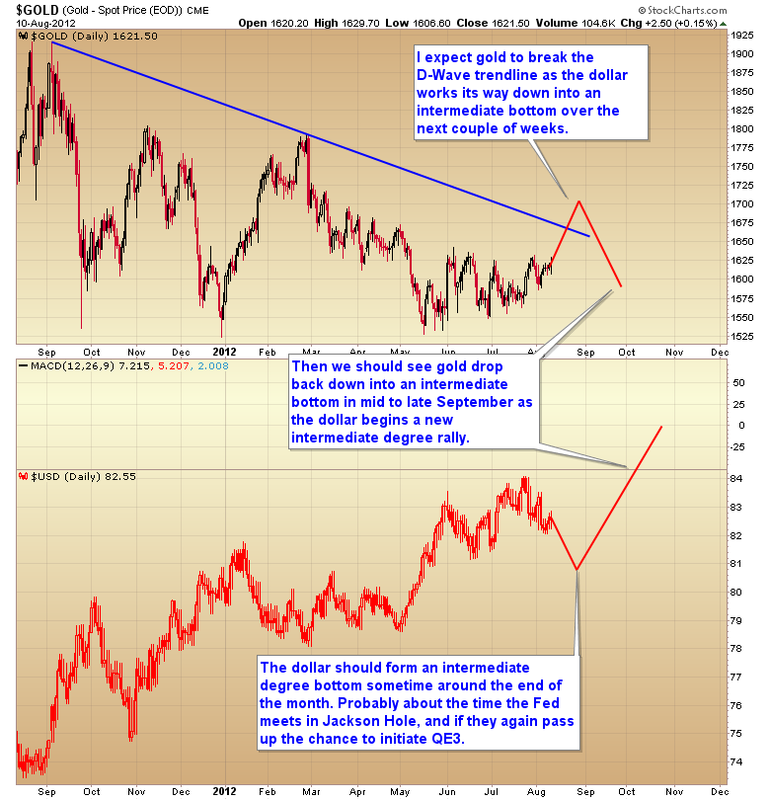 At that point I suspect gold will start to sniff out the next round of QE and will begin to resist the remainder of the dollar rally, very similar to what happened between May-July. 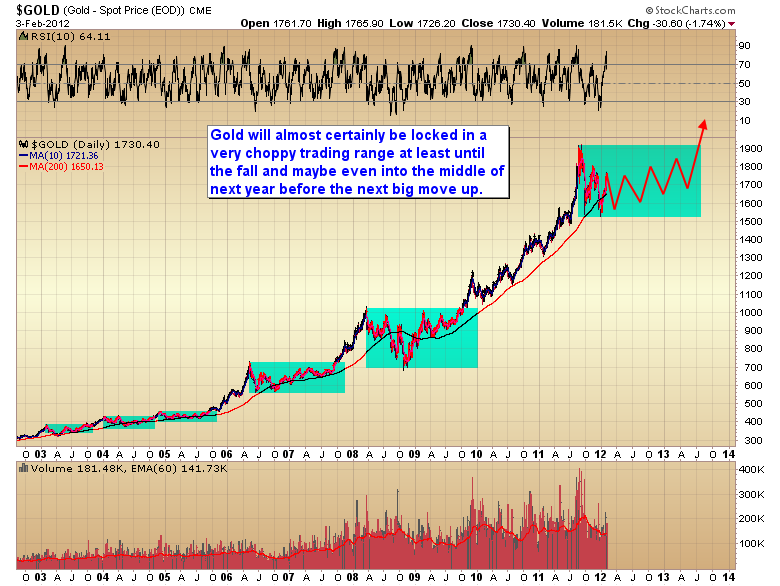 Open ended QE, which I expect to begin at the October FOMC meeting (there is a small chance that the Fed will act early in September), is going to be the driver of what should be an inflationary spiral, culminating with a parabolic move in the CRB and the next leg up in the secular gold bull (probably to $3500-$4000) as the dollar drops down into its next three year cycle low in mid-2014. This entry was posted in Uncategorized on August 12, 2012 by Gary. 3 weeks, that’s how long the bulls have left before stocks roll over and begin the next intermediate degree decline. That being said the next 2-3 weeks we should see some very healthy gains in virtually all asset classes. Why is that you ask? Because the dollar has begun moving down into an intermediate degree correction. As of Friday the dollar was on the 11th day of its current daily cycle. The normal duration of a daily cycle is 18 to 28 days, with the average being about 23 or 24 days. That would suggest that the dollar should bottom somewhere around August 21st or 22nd. As you can see in the chart below whenever the dollar moves down into an intermediate degree trough it generates strong gains in asset prices. 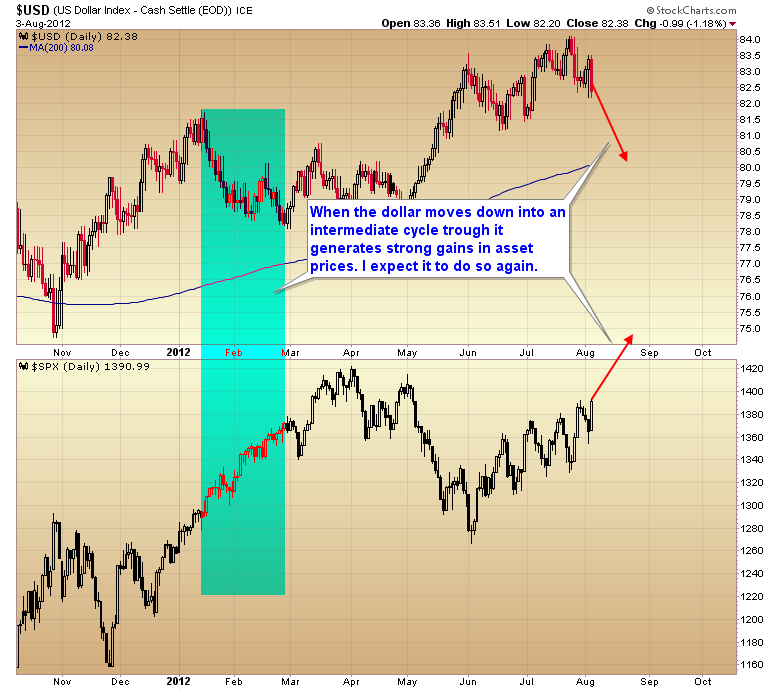 What follows once the dollar bottoms and the next intermediate degree rally begins is not going to be pretty. Stocks are going to start to struggle and ultimately move down hard in September and probably October if the Fed doesn’t unleash QE3 at the September FOMC meeting. By the end of August, and certainly by the time we get into September the markets are going to call central bankers bluff, and it is going to take more than words and the threat of quantitative easing to keep asset prices propped up. I have covered the rest of the forecast in depth in the weekend report available to premium subscribers. I will again offer the $1 two day trial subscription to traders that would like to sample the premium newsletter. If you like the newsletter do nothing and it will automatically convert to a monthly subscription when your two day trial expires. If you decide the newsletter isn’t for you just cancel your subscription by following the directions on the homepage before your trial expires. Click here to access the premium newsletter subscription page. This offer is only good for new members. If you are a previous subscriber the trial will trigger a monthly charge. This entry was posted in Uncategorized on August 4, 2012 by Gary. Just as I expected the stock market is back knocking on the door to new highs. 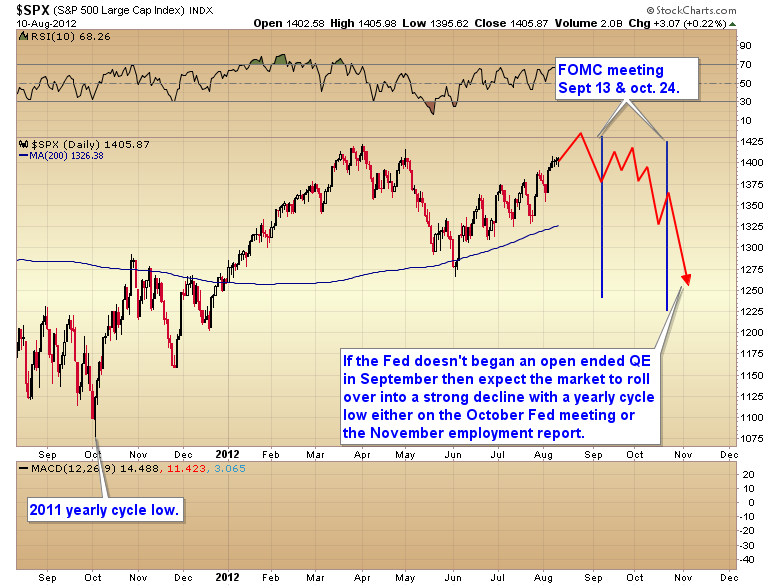 My expectation was for the Fed to do nothing. The ECB I really had no idea. But I was looking for a couple of days of mild selling following the Fed statement and then a resumption of the intermediate trend. I said last week when the bears started calling for a new bear market that it was too early in the daily cycle for stocks to top. This entry was posted in Uncategorized on August 3, 2012 by Gary.